The Refined Geek » Apple’s iPad: Not Just an Awkward Name. Apple’s iPad: Not Just an Awkward Name. Finally after the collective Internet hive mind being caught up in a flurry of speculation and turtle-necks we’ve finally been put out of our misery and Steve Jobs has unveiled the much rumoured new product: the iPad. It has caused such a fluster that it managed to eek its way onto the local news this morning, something which things like shuttle launches struggle to do. I’d been following the rumours pretty closely in the hopes that whatever Apple released would be appropriate for a demonstration I was planning for when Geon hit the next milestone. To be honest I’m a little disappointed at Apple’s offering, but not for the reasons you might think. Apple is renowned for their good design and keen eye for minimalist aesthetics. 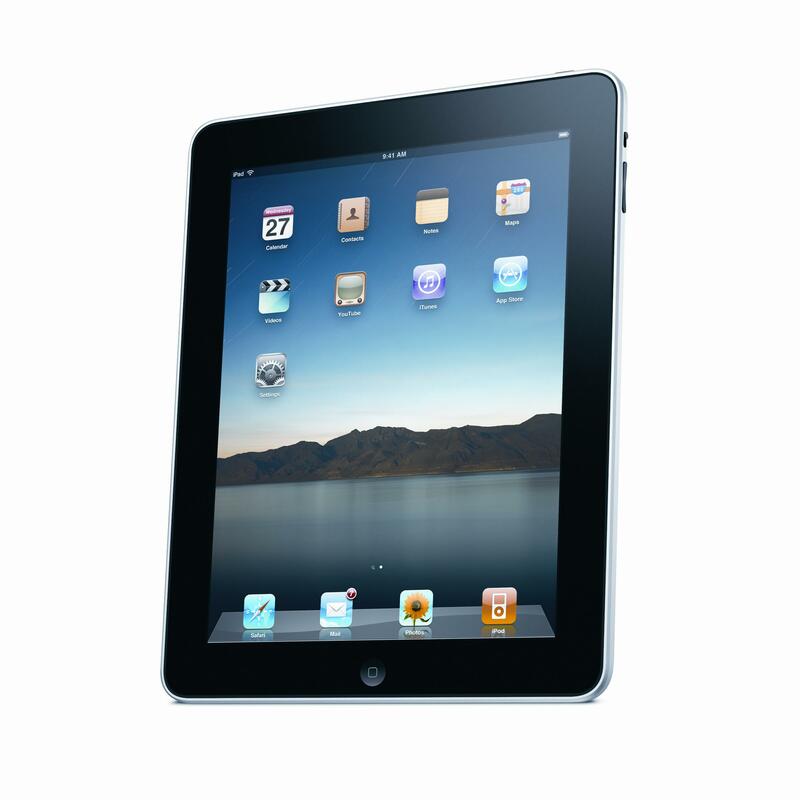 The iPad unfortunately suffers from the legacy of its predecessor the iPhone. Initial mock-ups that floated around the Internet showed something scarily similar to that of the picture shown above which is in essence just a scaled up iPhone. The kicker here is though that unlike the iPhone the iPad has a giant black bezel around the screen which makes it look kind of clunky. I can see why they did this though as the device is only half an inch thick, something which they would’ve struggled to achieve had they not made it a little taller and wider. Still it looks more like those cheap digital photo frames more than a classy Apple product. I’ll still reserve final judgement for when I see one of these things in the store though. Nice sized screen and lots of connectivity options so that’s a good start. Where things start to awry is when you look at what’s under the hood: a 1GHz custom CPU, hard drives smaller than the majority of SSDs available and no mention of how much ram the thing has. What I’m seeing here is actually just an upscaled version of the iPhone something that’s actually quite comparable to say the Nexus One. So realistically it would be more aptly described as a stripped down netbook, as it doesn’t really have much grunt behind it at all. Though I admit the iPhone did show you can do some quite interesting stuff with minimal amounts of power. The real crux of it though comes down the Operating System (OS) that runs on top of all this hardware. Seeing it this morning it looked like the iPad was running yet another custom OS from Apple. Turns out this isn’t true and it is in fact running the 3.2 version of the iPhone OS. So the iPad shares the flash immunity of its iPhone brother (and by extension, Silverlight to) and will be limited to applications available on the app store (seems Apple isn’t done milking that cash cow just yet). So it looks like the rumours of the iPad just being a huge iPhone are confirmed, which is extremely disappointing. So overall Jobs has put forward something that is far from revolutionary, is extremely limited in its application and really fails to meet the industry standard of what we’ve come to expect from a tablet PC (be honest with yourself, its a scaled up MID). I wholeheartedly swallowed the rumours on the device and was quite prepared to shell out $1000 for something that would be running say a cut down version of OSX, but it seems that’s never to be. I’m sure the iPad will enjoy a decent amount of success thanks mostly to the Apple brand but when the $800 netbook I bought months ago runs circles around it you can guarantee one of these won’t be making an appearance in my house. And I thought I was beginning to like Apple, for reals. Iphones support PDF’s so lets hope that the ipad does too. Then its just a question of accessibility and use of other formats. I do think Apple is erring in trying to make everything go through its itunes store. the ipod was a success for 6 months before the store came out. You be much better off with the Kindle DX if that was the case then. Same size screen but its E-Ink so it will be much more usable than the LCD screen of the iPad when it comes to reading books. The iPad only has the eBook reader functionality tacked on as a little extra. The real market is basically as a Mobile Internet Device. Anything the iPhone does the iPad does to, since they share the exact same operating system. iTunes was released well before the iPod and was key in the iPod’s success, not the other way around. I know where the confusion is coming from though as Australia had a delayed iTunes release due to licensing issues with our music overlords. Pingback: The Refined Geek » Talk About Sticker Shock: The $17,000 Watch.